Multi-function - You can charge all versions of the Apple Watch (38mm and 42mm sizes), iPhone (7/7Plus/6s/6sPlus/6/6Plus/5s) or most smartphones at the same time with this stand. 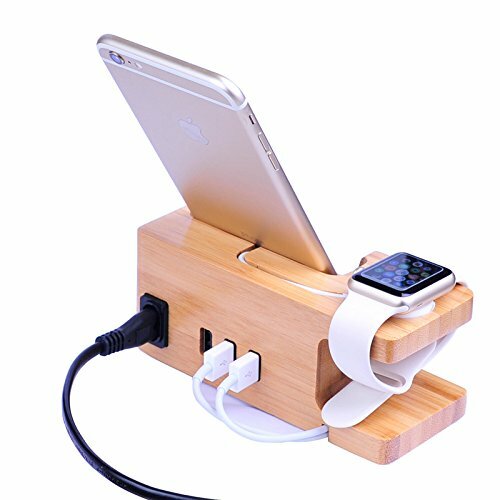 Built in 3 Safe Powered USB Ports - The stand is CE/UL certified. Three 3.0 USB ports (the output is 3.0 A total) enable you to rapidly charge your tablet, iPhone, Android and smart phones simultaneously at any time. Each port will intelligently identify your device and charge the device at highest speed with the smart IC installed. Eco-friendly Material & Compact Design - The station is made of natural bamboo wood. The surface of stand is sleek and it is a great place to keep your iWatch clean and safe during charging with the elegant and compact design. This Natural Bamboo Wood design makes your office and house naturally elegant. Stable & Solid Construction - Bamboo stand is as solid build for better stabilization. Effectively prevents the charger from sliding with the soft rubber pad on the watch charging port. Besides, the soft foam mats on each corner of the bottom makes it more stable and prevent the charger from sliding. Portable & Easy To Take - Hidden compartment underneath with backside access port enables you to storage and sort out the cable conveniently. The item is light and compact, which make the stand perfect for traveling. If you have any questions about this product by AICase, contact us by completing and submitting the form below. If you are looking for a specif part number, please include it with your message.